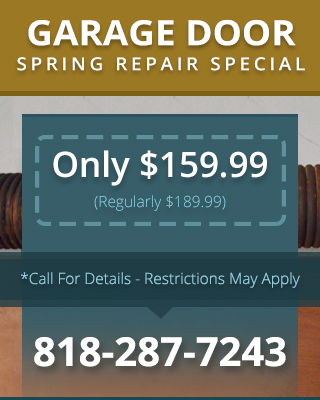 Like any piece of mechanical equipment, garage doors need maintenance. Without maintenance, on the other hand, it is easy for slight misalignments to lead to serious problems like bent door tracks, warped doors, or even burnt out garage door opener motors. Any one of these problems can be costly, not to mention annoying. Fortunately, our scheduled garage door maintenance in North Hills CA can help limit the damage caused by worn parts by identifying them early on. Our friendly, professional technicians know exactly what to look for in an inspection and they can quickly and effectively provide the maintenance you need. At Carroll Garage Doors, we believe that safety should always be a priority. In order to keep you safe, every maintenance visit includes an inspection of the safety features on your garage door. Reversing mechanisms can get over-sensitive, preventing you from shutting the door, or photo eye sensors can burn out, leaving you vulnerable to an accident. If you want to keep your garage door working properly and avoid accidents and other nasty surprises, investing in preventative garage door maintenance in North Hills CA should be very helpful. Because our technicians are experienced with all kinds of garage doors and opener systems, we can provide whatever kind of maintenance you may need.